Last week, we had our first post-chemo scan. It had been about eleven weeks since her last round of chemo ended. Emily will have a lot of follow-ups in the coming years, but the ones that are most stressful are her chest scans over the next two years. If cancer comes back, it will likely be found in her lungs, and a majority of the time it comes back within two years. Medically, there is a 70% chance her cancer will never return. We know that God is sovereign over all of that and we are trusting Him completely rather than statistics, but we are so thankful for the medical experts who have cared for our daughter. They have used the gifts God has given them to do His sovereign work. We are praying that Emily will be in that 70%. She truly has been an inspiration to me this last year, and we have seen great growth in her through this incredible trial. I think God has much in store for her future. We are thankful that the 3-month chest scan came back clear! They took an X-Ray of her knee joint. It looks like the knee and bone replacement seems to be functioning well. Her physical therapist is pleased with her progress. For the next two years, she will undergo a chest scan every 3 months. The third year, she will have a scan every four months. The fourth and fifth year, she will have scans every six months. With it will be a lot of other tests, bone scans, monitoring her heart and hearing (that could sustain delayed damage from her chemo) as well as other tests I’m sure I’ve forgotten. If you are reading this, you are probably one of the thousands who have prayed for Emily and our family. Thank you! Our praise and the credit goes to God. We are grateful for her medical team. And we are thankful for you, who prayed and cared for our family over these 12 months. 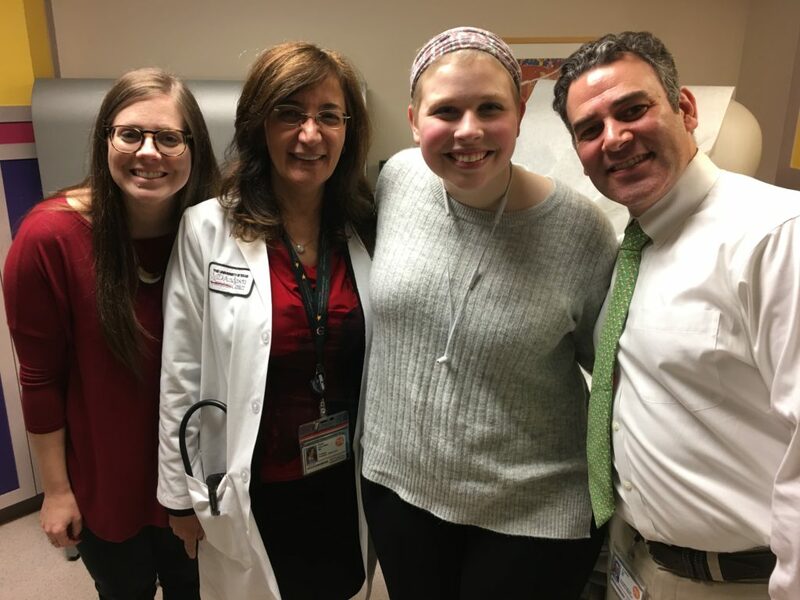 Whitney (Emily’s PA for oncology), Dr. Daw (Emily’s oncologist), and Dr. Gill (on rounds, Dr. Gill would spend a lot of time with Emily and our family). We are very thankful for these three. They have cared for our daughter in ways we never could. We waited what seemed like forever for the results. So we found ways to entertain ourselves. 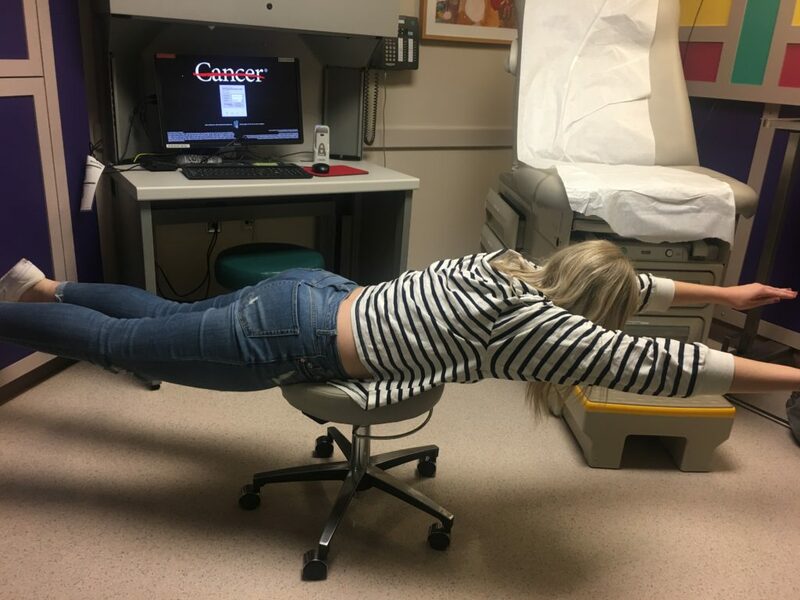 Morgan won the planking contest. 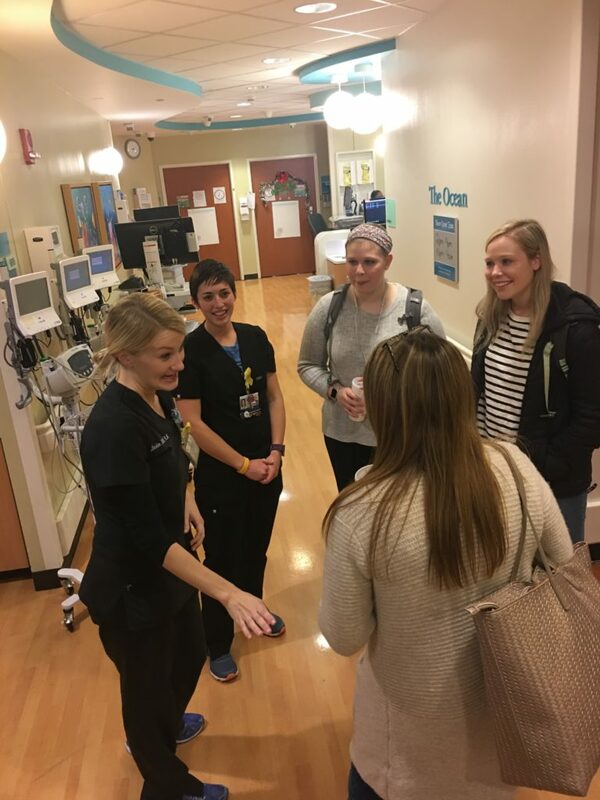 We stopped at the Pediatric Oncology floor (where we’ve spent much of the last year) to see some of Emily’s favorite nurses. Daisy was happy to hear the results too. 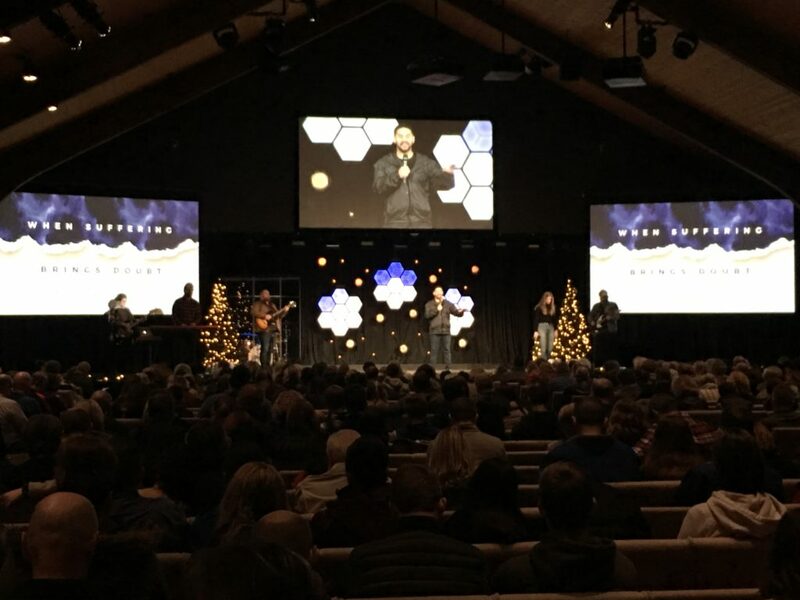 Secondarily in importance, the weekend of December 8-9, I candidated at New Heights Church in Vancouver, Washington. It is a multi-site church (4 locations) with about 3000 weekend attendees between 12 services. There are similarities and differences, and I will be dependent on God to help me lead the staff well. This past weekend, the church voted 98.3% to call me as their Lead Pastor. So we will be transitioning from Houston, TX to Vancouver, WA in the coming weeks. There are many similarities between Northridge Church (where I pastored for over 15 years) and New Heights Church. There are also some significant differences. I will be teaching less often. At Northridge, the least I ever taught was 35 times a year. That likely will be the most I will teach at New Heights as Team Teaching has been a strong hallmark of their ministry. I had the opportunity to build a staff at Northridge Church. At New Heights, I will inherit a staff who has been effectively leading for a long time. But with that will come adjustments for all of us. At Northridge, after over 15 years, I passed the baton of leadership to a new young leader. At New Heights, I was handed the baton by the lead pastor who led well for over 27 years. Perhaps this is a surprise to you, and I’d be happy to share the story of how God has led in this direction. For now, we would appreciate your prayers as we work through all the details of moving. I never imagined when we moved in 2016, we’d be moving again in 2019. But God has made it clear – this is the step we should take. This is one of the campuses of New Heights Church (Saturday night service). This is the weekend I candidated. 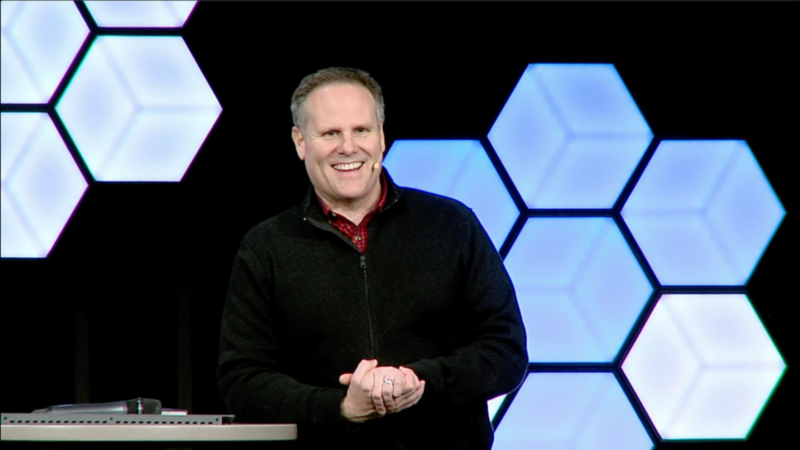 I plan to speak at New Heights on January 5-6 to open a new series with the Teaching Team. We will be working on our plans to move as I finish up working with the churches I’m currently working with. As only God can do. How long ago Happy T seems! I have great memories of Happy T!! Amen and amen. Everyone I think of Emily, I ring my back yard bell! Concentrate on the positive ! Continued success to all! That’s amazing! Thanks so much!! Thanks for this. It’s been a long time! Will be praying for Emily and your family. Boldly asking for full remission and no return. Scott! Wow! It is great to hear from you! Thanks for your prayers! I trust all is well. Yeah for Emily and yeah for family move but….you realize that’s more snow…???? Yes, more snow… We miss the snow!! Although they only have a few inches a year – compared to 100 inches in Rochester. So cool on both fronts. Your encouragement to me when we met for just one hour as you passed through Indianapolis to meet with me has stuck with me all this time. Your encouragement is going to be a blessing to your new church family. Praying for your transition and for Emily’s continued health and healing. So happy for Emily!!! What a wonderful blessing to have clear scans!! So excited for you David! We will be praying for you and the family as you transition to Vancouver! Did you know we lived there before we moved to Rochester?? Great town! You did?!?! I forgot that! We are looking forward to getting to know Washington! I have been praying for all of you and will continue to, I’m very happy for the results. Have been praying & will continue to as well. Soooooo overjoyed about Emily’s results. While geographically you just got a lot further from us in NY – you also just got a lot closer – another AMAZING teacher, I get to add to my weekly list & watch/ listen to – so excited to see what God has planned! Thanks, Lisa. You are so kind. Praise the Lord for Emily’s progress. We will continue to pray for her. Congrats David on returning to being a Lead Pastor. You’ll be missed at Vanderbloemen but what a way to start the new year, serving in a row God selected for you. Praise God.